Pro Fortran builds faster code with exclusive Dynamic AP load balancing, SMP analysis, and advanced optimization. 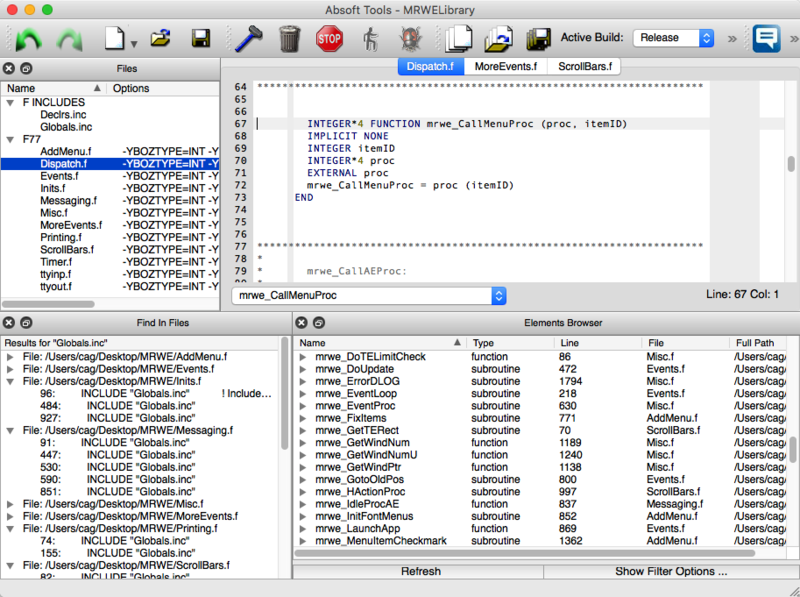 The AbsoftTools integrated development environment speeds program development and maintenance. Complete command line development support is also provided. The OS X Fortran compiler supports a full range of project targets including command line programs and GUI based applications. It provides a complete 64 and 32 bit OS X Fortran compiler solution and supports mixed language development by interfacing with Apple’s Xcode C/C++ compiler. The AbsoftTools development environment simplifies code development by solving the problems associated with IDEs such as Visual Studio and Xcode – excellent for C++, but with no knowledge of Fortran. The Absoft Fortran IDE supports both Fortran and C and automatically provides proper syntax sensitivity, array indexing, etc. for each language. It includes everything you need: full Fortran 95 compiler with F2003 and F2008 features, programmer’s editor, Fx3 source-level debugger, application framework, graphics and optimized math libraries in a single, easy-to-use package. Obtain your copy of Absoft Pro Fortran by selecting one of these options. While most product configurations are available online, we understand you may have different requirements. If you have questions or desire specific configuration not listed online, your Absoft Sales Team is ready to help. Bundle the new IMSL 2018 with Pro Fortran and save time and money! The IMSL 2018 Fortran Numerical Libraries are a complete collection of mathematical and statistical algorithms which integrates the world-renowned IMSL Fortran 90 and Fortran 77 Math and Statistics libraries into a single, cohesive package. Ensuring our products perform with stability and efficiency is one of our highest priorities. From time to time we’ll release improvements to our existing software releases known as service packs. Downloadable service packs and updates to our products contain improvements, performance enhancements, new features, bug fixes, and other product additions. Visit the Service Pack download page to update to the latest service pack for your Pro Fortran release.